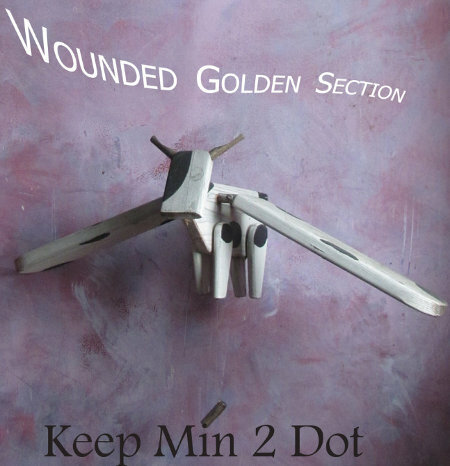 Keep Min 2 Dot, "Wounded Golden Section"
2/14/2019 by tom moody Comments Off on Keep Min 2 Dot, "Wounded Golden Section"
A quick review of a Bandcamp LP, Wounded Golden Section by Keep Min 2 Dot. The instrumentation is traditional but varied -- guitar, keyboard, reeds, bass, drums -- but doesn't follow roles assigned to the typical jazz combo. WGS shares affinities with free jazz or RIO but exists in an ambiguous state of "might be studio/might be live performance." It doesn't sound overtracked and it's not evident if "the computer" or DAWs were employed at all. It feels very organic and live-improvisational. Structure-wise, it's "full" in the sense of sonically and compositionally rich. Each song is a mesh or skein of granular moments -- like atoms -- consisting of a cluster of instruments, tunes, or rhythms. Each atom has its own mood and set of musical associations, and feels as if it could be spun off into its own composition. The overall mesh of the tune works like a complex abstract painting, with threads that could be pulled or followed. All that said, it is not dense, sonic bombardment a la noise music but an "open weave" with overlapping moments flowing from one to the next. The performances on all instruments are good-to-excellent, almost like samples of "great licks" since the quality or excellence is not in the service of any kind of traditional song structure or development. I have two versions of Bach's Brandenburg Concerto No. 1, both I Musici performances. The tape, released sometime in the '80s or '90s, consists of a 1965 recording that was digitally remastered and then transferred to audiocassette, on the Philips label. The vinyl features a later performance, from the mid-'80s, also by I Musici (including some but not all of the same musicians), also on Philips, also digitally mastered, before being pressed on vinyl. Below are mp3 rips of the same section from the fourth movement, a passage for brass and woodwinds. I much prefer the tape version! It's punchier and quirkier. The tempo is slightly faster, and the bassoon part (I assume it's a bassoon, might be oboe) is more prominent and percussive. The vinyl version emphasizes the horns over the reeds and feels more slurry and mushy, although still very professionally played. It's tempting to say the 1965 performance is better than the 1985 performance, as in more spirited and distinctively rhythmic. It's hard to say, though, when there are so many electronic aspects to the comparison (recording, mastering, pressing, media type). Simple microphone placement can drastically change classical music. At the mastering stage, certain frequencies can be accentuated or diminished. The tape version has more hiss and the higher frequencies may be adding a "brighter" sound. Eerie music for ritualistic flame-jumping. In a related YT, Barry explains how he made the song by extracting the drum groove from one vinyl release and the piano chords from another. The song wouldn't work without his patient surgery on the MIDI notes and polish at the production stage. See also Seacrestcheadle's fan video [vimeo] of RP Boo's song Wicked'Bu, from that release.